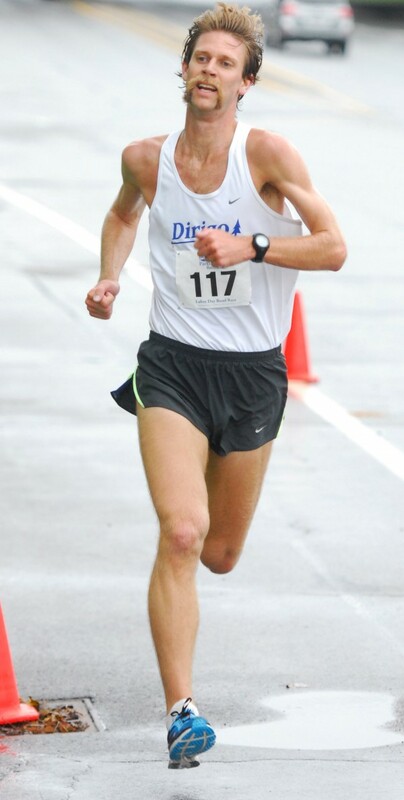 Adam Goode of Bangor, winner of the 2013 Labor Day Road Race in Bangor. Sarah Mulcahy of Baring Plantation, winner of the 2013 Labor Day Road Race in Bangor. BANGOR, Maine — Adam Goode knows Bangor’s west side well. He lives there, represents it in the Maine Legislature, and often uses its streets as a training ground for his athletic passion — running. And while that familiarity didn’t necessarily make the difference Monday morning, surely it didn’t hurt as Goode became a two-time champion of the Bangor Labor Day 5-Mile Road Race. Goode, 29, finished the race in 25 minutes, 29 seconds, matching the second-best time recorded in the race’s 51-year history. Goode tied the winning time run by Judson Cake of Bar Harbor in 2005, which stood as the course record until Ellsworth’s Louie Luchini shattered that mark last year by winning the 50th anniversary of the event in 25:02. Sarah Mulcahy, 28, of Baring Plantation won the women’s division of the state’s second-oldest road race, placing 15th overall among the field of 152 finishers in 31:46. Runners were greeted with overcast, humid conditions and a new starting line on a fairly steep downhill grade on Dutton Street between Hollywood Casino and Geaghan’s Pub and Restaurant. The course then took a sharp left to follow the Bangor waterfront before picking up its previous route that traveled through downtown streets and up to the west-side residential area before finishing along outer Main Street at the home of the race-hosting Bangor Parks and Recreation Department. Goode, who also won this race in 2006, was challenged for much of the race by Old Town’s Erik McCarthy until gaining some separation amid the hills of Mile 3. “A lof of it is how you manage that hill in the middle, because probably all the miles except for the middle mile are net downhill,” said Goode, also the head cross country coach at Bangor High School. McCarthy finished second in 26:03, with Eric Mauricette of Old Town (27:56), Ben Schippers of Brooklyn, N.Y. (28:17) and three-time race champion Perry LeBreton of Kenduskeag (28:33) completing the top five. Mulcahy, a middle-school math and science teacher in Baileyville and one of the more successful runners in the state this year, led the women’s field from start to finish but had to hold off a late-race challenge from Portland’s Laura Johnson. “I heard footsteps, but I didn’t look back,” said Mulcahy, who averaged a 6:22 per mile pace. Mulcahy, whose victories earlier this year include the Bay of Fundy Marathon in Lubec in late June, edged Johnson by three seconds to win the Bangor race for the first time with a time nearly two minutes faster than her 33:38 clocking that was good for a third-place finish in 2012. “I’ve been suffering some injuries since the Bay of Fundy, but I didn’t stop. I ran an ultra (marathon) and continued running halves and everything,” said Mulcahy. “But I seem to be good to go now, and I’m training for MDI (Marathon on Oct. 20). Lindsy Argus of Hermon (33:08) was third in the women’s field, followed by three-time champion Kristine Guaraldo of Brewer (33:13) and Katherine Collins of Winterport (34:17). Collins also was the women’s masters champion while 51-year-old Chris Holt of Ellsworth won the men’s 40-and-older title, placing seventh overall in 30:15.